The start of a new hockey season is important because first impressions count. This includes the how you think and portray your mental attitude on the ice. You know the look of a confident and positive player. I’m not talking about boastful confidence. I’m talking about quiet confidence. A player that skates, stick-handles, and passes with confidence. A player who is not rattled by mistakes. Likewise, you can always tell when someone is struggling to keep a positive mindset. Players with a negative mindset keep their head down a lot, beat themselves up after mistakes, look frustrated when not performing well, and give up easily when faced with adversity. 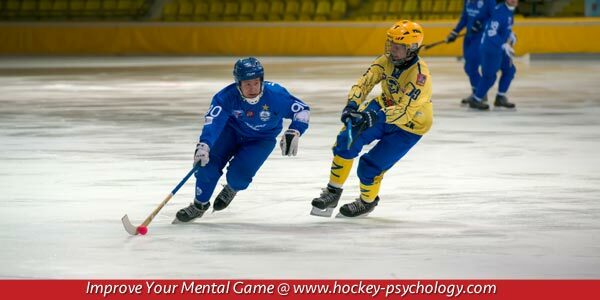 Your mindset at the start of the season is very important not only for coaches and teammates having confidence in you, but also how you think and behave on the ice. Let’s face if, no one wants to be around a whiner or ice-kicker after he misses an open net in practice. How do you carry yourself with confidence at the start of the season? You want to have the look and the thoughts of a confident player such as a Messier, Gretzky, or Lemieux. I tell my students that confidence is a state of mind. Confidence starts on the inside – that why it’s called SELF-confidence! A player with confidence on the inside will automatically look confident on the outside. Always remember that you have paid your dues in hockey. You deserve to play well. If you have been playing for five years for example, you have five years of practice and experience to back up your confidence. Never let the small setbacks, such as a poor practice, derail a stead train of confidence based on five or more years of play. A positive attitude is contagious in the locker room! You want to be confident (yet not boastful) in your conversation with others. Always focus on what you want to accomplish in the upcoming game or practice, not what you dread. Never dwell on past problems or mishaps. Show your excitement and enthusiasm to get back on the ice. Love the challenge of getting better each day and striving to be the best and think the best you can each day!